(Nanowerk News) A new device developed by UCLA engineers and doctors may eventually help scientists study the development of disease, enable them to capture improved images of the inside of cells and lead to other improvements in medical and biological research. The researchers created a highly efficient automated tool that delivers nanoparticles, enzymes, antibodies, bacteria and other “large-sized” cargo into mammalian cells at the rate of 100,000 cells per minute — significantly faster than current technology, which works at about one cell per minute. 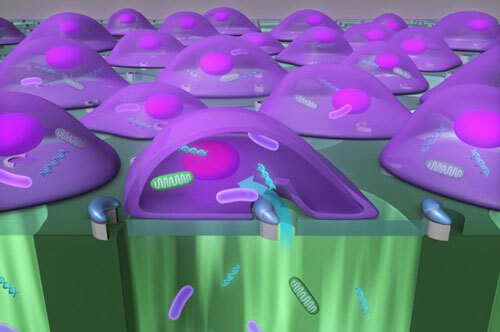 A team led by Professor Eric Pei-Yu Chiou created a tool that delivers nanoparticles, enzymes, antibodies and bacteria into cells at the rate of 100,000 cells per minute — significantly faster than current technology. The research, published online in Nature Methods on April 6 ("Massively parallel delivery of large cargo into mammalian cells with light pulses"), was led by Eric Pei-Yu Chiou, associate professor of mechanical and aerospace engineering and of bioengineering at the Henry Samueli School of Engineering and Applied Science. Collaborators included students, staff and faculty members from the engineering school and the David Geffen School of Medicine at UCLA. Currently, the only way to deliver so-called large cargo, particles up to 1 micrometer in size, into cells is by using micropipettes, syringe-like tools common in laboratories, which is much slower than the new method. Other approaches for injecting materials into cells — such as using viruses as delivery vehicles or chemical methods — are only useful for small molecules, which are typically several nanometers in length. Researchers use a laser pulse to heat the titanium coating, which instantly boils the water layer adjacent to parts of the cell. That creates a bubble that explodes near the cell membrane, resulting in a large fissure — a reaction that takes only about one millionth of a second. The fissure allows the particle-filled liquid underneath the cells to be jammed into them before the membrane reseals. A laser can scan the entire silicon chip in about 10 seconds. Inserting large cargo into cells could lead to scientific research that was previously not possible. For example, the ability to deliver mitochondria, could alter cells’ metabolism and help researchers study diseases caused by mutant mitochondrial DNA. “The new information learned from these types of studies could assist in identifying pathogen targets for drug development, or provide fundamental insight on how the pathogen–host interaction enables a productive infection or effective cellular response to occur,” said Dr. Michael Teitell, chief of the division of pediatric and developmental pathology, and a co-author of the paper.